Books V and VI find Raphael relating recent celestial history to Adam as part of a mission from the Father. He tells Adam of the war in Heaven between the rebellious and loyal angels, effectively bringing us, by the end of Book VI, up to the starting point of the poem in Book I: Satan’s fall, with his cohort, from Heaven into Hell. In a departure from my usual practice, I’m going to let Milton himself give you the synopsis of these two books (Yes, he’s considerate enough to provide a synopsis for each book before the verse starts. Isn’t he great?). Also, I’m writing this late at night, so things may get, shall we say, irreverent? Morning approacht, Eve relates to Adam her troublesome dream; he likes it not, yet comforts her: They come forth to their day labours: Their Morning Hymn at the Door of their Bower. God to render Man inexcusable sends Raphael to admonish him of his obedience, of his free estate, of his enemy near at hand; who he is, and why his enemy, and whatever else may avail Adam to know. Raphael comes down to Paradise, his appearance describ’d, his coming discern’d by Adam afar off sitting at the door of his Bower; he goes out to meet him, brings him to his lodge, entertains him with the choycest fruits of Paradise got together by Eve; their discourse at Table: Raphael performs his message, minds Adam of his state and of his enemy; relates at Adams request who that enemy is, and how he came to be so, beginning from his first revolt in Heaven, and the occasion thereof; how he drew his Legions after him to the parts of the North, and there incited them to rebel with him, perswading all but only Abdiel a Seraph, who in Argument diswades and opposes him, then forsakes him. Raphael continues to relate how Michael and Gabriel were sent forth to battle against Satan and his Angels. The first Fight describ’d: Satan and his Powers retire under Night: He calls a Councel, invents devilish Engines, which in the second day’s Fight put Michael and his Angels to some disorder; But, they at length pulling up Mountains overwhelm’d both the force and Machines of Satan: Yet the Tumult not so ending, God on the third day sends Messiah his Son, for whom he had reserv’d the glory of that Victory: He in the Power of his Father coming to the place, and causing all his Legions to stand still on either side, with his Chariot and Thunder driving into the midst of his Enemies, pursues them unable to resist towards the wall of Heaven; which opening, they leap down with horrur and confusion into the place of punishment prepar’d for them in the Deep: Messiah returns with triumph to his Father. As you can tell, Books V and VI are heavy on action (hence today’s post title. Which was a joke. I hope.) Book V features a particularly Miltonic moment, however: a lone voice raised against wrong action, in the form of Abdiel’s resistance to Satan’s call for rebellion and war. On the surface, Satan’s initial raillery against the Father’s elevation of the Son might seem appealing to a republican (small-r) revolutionary like Milton: Satan objects to being asked to prostrate himself to a new master (especially one whose power seems to derive from nepotism) who promises to hand down new laws that must be obeyed. One over all with unsucceeded pow’r. I won’t quote lengthy passages from Book VI, but it’s one of the most entertaining books of the poem, in which Raphael describes to Adam (Eve being noticeably absent, having fulfilled her womanly serving duties *grumble grumble feminist grumble*) the progress of the war. On the first day, Michael leads the loyal angels against Satan and his followers. Angels on both sides are injured, but only the rebel angels feel pain (and we also learn that they’ve lost the ability to feel pleasure). Angelic bodies heal themselves, it turns out. Michael faces Satan in single combat, and Satan, to his dismay, is bested and forced to retreat. During the night, the rebel angels invent cannon (often regarded as devilish in the Renaissance) and surprise the heavenly hosts, who respond by hurling mountains at their foes. The imagery here is so fantastic — it just cries out for Guillermo del Toro. (Michael Bay, in the unlikely event you’re reading this blog: STAY AWAY FROM MILTON.) Plus Satan engages in some tricky non-diplomacy and witty banter with his pals, so now I’m envisioning a del Toro/ Aaron Sorkin collaboration . . . But I digress. Fear will keep the local systems in line. Fear of this battle Son. Wait. Where have I heard that before? Coming up on February 10: Books VII and VII — Adam’s Edenic education continues. A programming note: Today features a rare double post here on Rosemary and Reading Glasses, so you might like to scroll down or click over to today’s earlier post, a review of Melissa Pritchard’s fascinating novel Palmerino. Argh, I can’t wait to jump back into this. There are still books of Paradise Lost that I haven’t even read (we only read pieces for class), and this is one of them. Book 6 sounds phenomenal. Is it wrong that I totally want to see this happen? I’ll be back to comment, in full, once I’ve read the books myself. I don’t want to get too deep into it just yet. That’s my first-ever slow clap. Mission accomplished. I find it highly unlikely that I haven’t given you one before. I’m pretty liberal with them. Once again I find myself feeling deflated. As soon as I wrote that I realized that I totally took the wind out of your sails. I know! Grudgingly, I agree to be placated. It all makes more sense when you explain the story! I definitely agree that the action and imagery in these books is amazing and I would love to see it translated to screen by a capable director. I’m a little behind in writing my post, but hope to do it this weekend. Thanks, CJ! I’m glad you’re liking 5&6 — can’t wait to read your post! I enjoyed the irreverence! And thank you for taking the time to provide succinct summaries and helpful notes to important aspects of the poem. 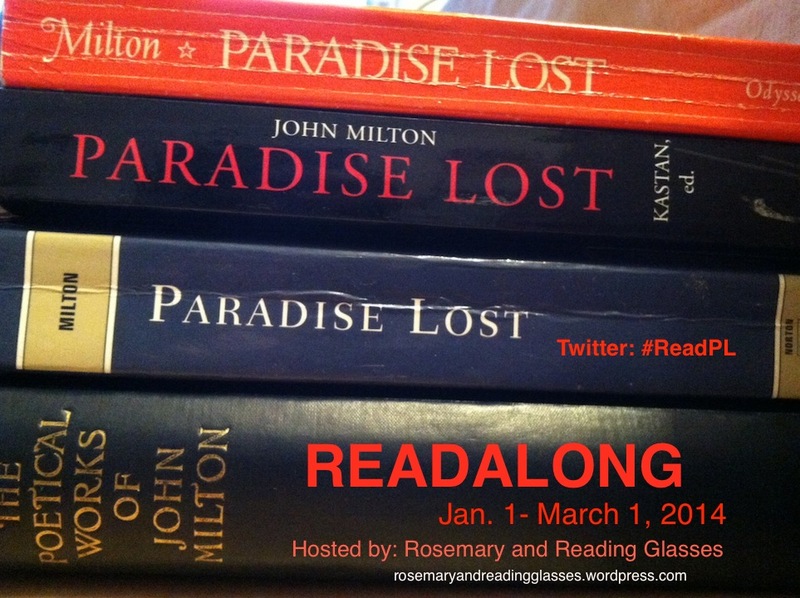 Here is my post: http://cleoclassical.blogspot.ca/2014/02/paradise-lost-read-along-book-v-and-vi.html Better late than never. So sorry to my fellow readers that I haven’t been commenting more on their posts. I’ve been rushing just to get my post up on time but I promise I will try to do the rounds to see what everyone else has written. Part of the fun of a read-along is to see the different summaries/thoughts, so I will be better with this in the future! Don’t feel bad. Every week I seem to fall behind a bit more and have to catch up too! It’s really odd — she’s listening but then she leaves, ostensibly because she prefers to hear a recap of the conversation from Adam rather than from the primary source. Strange. And, well, I pity Satan. His foes are cheating and he can do nothing about it… How do you fight a host which can just drop all weapons and still win? NOT FAIR!